The Sheffield Philharmonic Orchestra is a friendly, enthusiastic and ambitious amateur orchestra based in the centre of Sheffield. 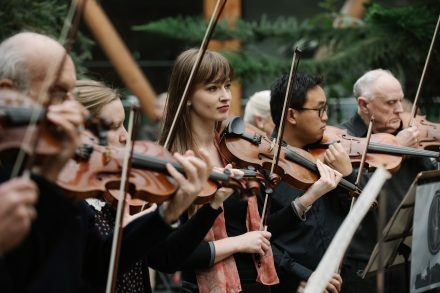 We give no fewer than five concerts a year, including a family Christmas concert and the Rotary Club's annual 'Music in the Gardens' proms concert at the Botanical Gardens. We rehearse on Tuesday evenings in term time (19.30 – 21.45) at the Victoria Hall Methodist Church (adjacent to the Crucible theatre) and draw players from across Yorkshire & the Humber, Lincolnshire and Derbyshire. We currently have vacancies for Double Bass players grade 6+; and a Tuba player. We also run a deps/waiting list so even if there isn't a seat advertised do get in touch and say hello! If you would like to be added to our mailing list please contact us via our website!